I have been party to some discussion on social media about the wearing of gloves at "Art Deco" or "Roaring '20s" events. 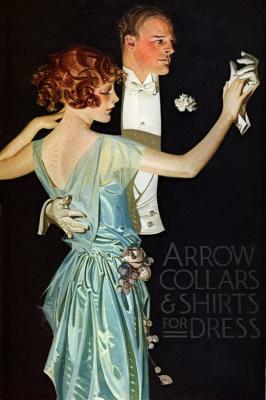 There is a general presumption, based I suppose on the state of things at the beginning of the 1960s, at that moment when any notion of propriety in dress suddenly vanished, that in the Jazz Age as in the early '60s, gloves, especially for ladies, were an essential accessory for both day and evening wear. I suspect the pendulum was swinging back toward gloves by the '40s, but I'll leave documenting that for another day. I found a few illustrations of men from the '20s and '30s in proper white tie and tails, wearing the white gloves that are part of that formal uniform, dancing with ladies in fashionable gowns... and no gloves - though I have also seen plenty of evidence of men (mostly photos) in tails without gloves. However, men in the more modern and less formal Tuxedo/Dinner Jacket style seem to have almost never worn gloves. Some of gloveless men, when dancing, made up for this lack by holding a handkerchief in their right hand so their sweaty palms were not against a lady's gown or bare back. The general sense I got from reviewing the visual sources available to me is that gloves were not extinct, they were still worn by a few ladies and some gentlemen who favored them, but they were not the prevailing fashion, and were not worn by the majority. Further, while one might assume that gloves were more widely worn in Europe than in the States, I find a similar situation in looking at images and film clips from places like Britain, France and Germany. Perhaps they were a bit more common there, but gloves don't seem to have been the general rule anywhere in decades between the World Wars. So, I suppose my advice to people wondering about gloves for a current Jazz Age/Art Deco event is, wear them if you like but don't feel you have to. It's actually more typical of the time if you decide to go gloveless. My observation about gloves in the visual sources from the era is supported by an etiquette advice column from the '20s. Washington Post: "Conduct and Common Sense" column. Oct 11 1926, Anne Singleton. "VERY often people ask me about gloves. Of course, some women are uncomfortable unless their hands are covered. I know a woman who wears gloves almost all day long, even in the house, just because she hates to touch things with her hands. But most of us are glad to be spared the expense of constantly buying gloves. We wear them to keep our hands warm in winter and unsunburned in summer, clean on railway Journeys and uninjured when doing such work as gardening, but not much for convention at the present moment. Remember, however, that no moments stay present long. At the opera, at dances and evening entertainments, you see more hands ungloved. The mode may change, but that's how it is today. So, if a woman likes gloves, and thinks she looks better in them, she wears them. If she doesn't, she doesn't. On the whole, I think gloves for men at dances are rather a good thing, for if a man's hand is hot it may injure a girl's dress, or touch her back uncomfortably. It need not be a great expense, either, for two or three pairs, often cleaned, should carry a young man through a season. However, young men have not all taken to them yet, and I can only hope that, if they agree with me, they will. Brides and bridesmaids suit themselves about wearing gloves. Sometimes they write and tell me that they are going to wear short-sleeved dresses, and, therefore, don't I think long gloves are proper? The truth is, I don't think short-sleeved dresses proper. I hate them for anything but evening wear, and, as a fact, Vogue's New York world doesn't marry in the evening."